Golf - Play and SaveEliminate The Muda! « ______, You Are Using Too Much! Guilt – One of the problems with becoming aware of the long-term financial impact of your current spending habits! You begin to feel guilty when you want to splurge a little. It is amazing the transformation a day on the links had for me. For years I questioned why anyone would want to chase a little white ball around for several hours trying to knock it into a hole in the ground. Then I had a chance to play, for work no less! Imagine a sunny California day, the 12th hole on a course on overlooking the ocean. What a dream. But golf is expensive and expensive runs counter to everything frugal. In order to be frugal, does this mean you must give up everything you love and enjoy? I don’t think so, but it does mean that you have to be more strategic about how and when you splurge. If you are a golfer, the first order of business to being a frugal golfer is coming to terms with your ability. Is your handicap in the low single digits? If so, maybe you can justify a little greater investment in your equipment. Is your handicap in the double digits? Whatever clubs and bag you own now should be your last! With equipment in hand the next challenge is greens fees. Take the article previously written on cost shifting. Golf is a perfect example. Can you get your rounds picked up by your company, or a vendor? If you are good enough you might be able to bet the cost of the round with your buddies. Another consideration is looking at play times. If you are like most golfers and happy to break 100 then I question how important it is that we actually finish all 18 in a day. Most courses offer considerable discounts for afternoon or twilight tee times. 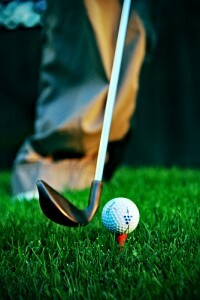 You might want to check out sites like GolfNow.com which sometimes has great rates on selected courses. If you are a regular player you may also benefit by purchasing an annual Player’s Pass. For a one-time fee of $67 you can save up to 50% at golf courses near you. Last you need to consider the cost of golf balls. Several years ago I scored 600 balls at a garage sale near a public course. The family’s kid would walk the course perimeter every day. The cost worked out to about $.20/ball. You can tell how well I play, because I am at the bottom of the barrel now! Looking for a new source of cheap golf balls I ran into this great company. LostGolfBalls.com has a wide selection of balls at up to 50% off the retail price. With over 300 brands and models you are sure to find something you like. These are not new balls. Like the kid walking the course, this company collects used balls from a number of sources. They grade them and then sell them at progressively greater discounts based on condition. But even their highest grade like new balls can be had well below retail. Take a look, you will be pleased. Tee’em high and let them fly!